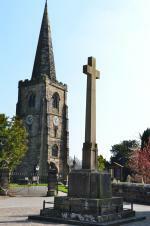 Duffield's War Memorial can be found outside St Alkmund's Church on Church Drive, near Eyes Meadow. It was dedicated in 1929 and lists those that lost their lives in World War I and II. A Remembrance Day Parade is held in November which is attended by local uniformed organisations and the Parish Council.